One of the loveliest waterways in Britain, the Kennet & Avon meanders 86 miles between Bristol and Reading, passing through the historic city of Bath. The route includes the fully restored Caen Hill flight of 29 locks at Devizes. The Kennet and Avon Canal opened in 1810, and after restoration was re-opened by HM The Queen in 1990. It passes beautiful, tranquil and unspoilt scenery with an abundance of plant and wild life, through bustling market towns, picturesque villages and past historic monuments. Frequently there are inviting canal side pubs offering lunch or supper. 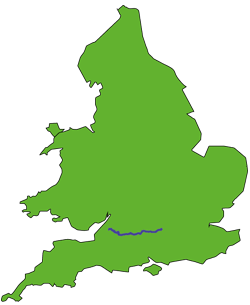 The waterway includes the Georgian splendour of the City of Bath and the pastoral pleasures of rolling Berkshire and Wiltshire, with unique architectural and engineering features of majestic aqueducts and bridges. Starting at Brunel's historic Floating Harbour at Bristol, close to the city's theatres, shops and restaurants, the route first takes the tidal River Avon to Bath. This spectacular World Heritage City has Georgian architecture and Roman remains including the famous Baths, Abbey and many historic attractions. Cruise through the dramatic valley of the River Avon over the Dundas Aqueduct and on to Bradford on Avon, a pretty small town with a fascinating history. Then on through rolling farmland to the famous flight of locks (29 locks in 2.25 miles) at Caen Hill. These locks take a day to ascend or descend! Passage needs to be booked in advance, although water shortages are not now a problem. Then pass through historic Devizes, home of the Kennet & Avon Canal Trust, with its canal shop, to Crofton, home of the famous working steam beam engine. The handsome town of Hungerford, has centre of town moorings, convenient for browsing around the many antique shops. The canal continues to Newbury, where you will find a touch of Venetian charm, and on to meet the River Thames just after Reading. The complete length of the canal and return takes 2-3 weeks. Several bases offer suitable out-and-back routes for one or two week trips, notably in the Bristol/Bath area or the central section around Devizes. There are a number of one week out-and-back routes on the Kennet and Avon Canal. Bristol and Bath area: This covers the section between Bristol and Caen Hill. The locks are not usually included in this week. Central Section: This very rural area provides a very quiet week in country scenery. Mid-week and weekend breaks are available. These can be adapted from the one-week routes above, and include the Bristol-Bath section. From Bristol it is an energetic two-week cruise to Newbury and back. From the Reading area it is a two week cruise to the Caen Hill flight and back. It is also possible to cruise the River Thames to London or to Oxford. Read what some of our previous clients say about the Kennet & Avon Canal. "Pewsey to Bath and return on the Kennet and Avon Canal. Wonderful canal scenery, terrific locks, especially Devizes. Canal from Pewsey to Bath and return, passing initially through picturesque rolling fields, past the white horse at Pewsey, through small quaint villages, to the Caan Hill locks at Devizes." "Excellent holiday - we went from Bristol along the Kennet and Avon Canal through Bath and Bradford on Avon to the base of the Caen Hill flight just short of Devices - and return. Lots of interesting and historic places." "What a sight and experience navigating the 27 locks down the hill to Foxhangers. The many canal side inns offered sustaining refreshments and jovial hospitality along the way, and the forest and rolling hills with manor houses from Bradford on Avon to the two aqueducts at Avoncliff and Dundas were breathtaking." "Bath - what can one say, it is awe inspiring to approach by canal, through the magnificent bridges and tunnels with the majestic sandstone buildings forming a backdrop all around. We spent a whole day exploring Bath, and reliving the same experiences of wonderment of our first visit in 1972! This was our first canal trip, but we are hooked! Already planning the next one!"